How should businesses handle hybrid cloud data security? As businesses move onto the cloud, many are choosing to adopt a hybrid strategy, where some of their cloud services are handled by a public cloud, and others on a private cloud environment. There are advantages to this approach, which is why it is so popular. Public cloud has a lower barrier to entry, providing many businesses with an opportunity to quickly incorporate cloud systems into their workflows. However, users must rely on the public cloud interface, and do not have as much control over their experience. On the other hand, private cloud is more customizable, and gives users full control over the structure of their cloud environment. This can be crucial for many businesses, particularly large enterprise corporations who have highly specialized needs. The downside is that private cloud is more expensive, and takes more time to configure to the specific needs of the organization. By adopting a hybrid strategy, businesses gain the best of both worlds, but it also complicates their security procedures. Many businesses assume that public cloud applications handle security themselves, but that doesn’t absolve businesses from security responsibilities on their end. And of course, the same can be said of securing a private cloud environment. If your organization is considering a move to hybrid cloud, here are some concerns you should take into account to ensure you follow security best practices. Choose the cloud environment based on data sensitivity. If you’re using a hybrid system, your first task will be to determine what data and which workflows belong on which environments. Generally speaking, data which is of the highest sensitivity should be in your private cloud, while less secure data can move onto your public cloud. Monitor user level access control. Splitting cloud use based on data sensitivity has less to do with the relative security of these systems, and more to do with how they’re used. 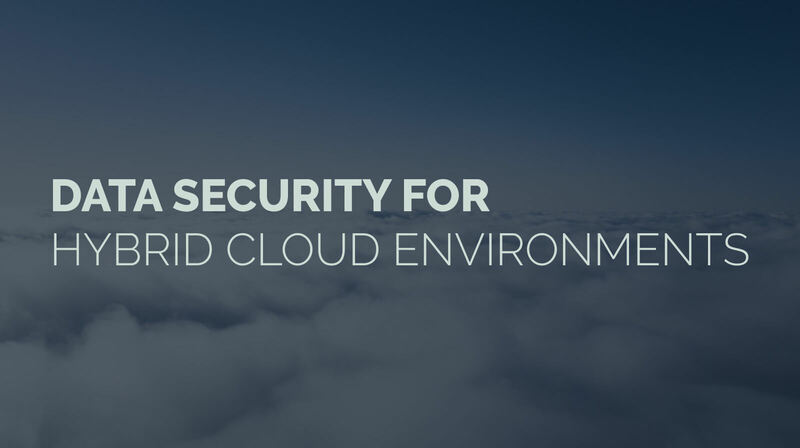 After all, public cloud providers have strong incentives to keep their platforms secure. However, most businesses tend to grant access to the public cloud more broadly than to their private cloud. When more users have access your public cloud, it expands the potential for a breach. By keeping highly sensitive data in a more controlled environment, businesses reduce the risk of a breach. One disadvantage to a hybrid cloud strategy is that it splits resources across multiple platforms. Without careful documentation, it can be easy for businesses to lose track of information about what data is stored where, who has access to it, and what security measures have been put in place to protect it. A documentation plan should track all this information, not only as a security measure, but to better understand the scope of a security threat. In the event of a breach, your business needs to quickly identify how much data might have been compromised. Documenting cloud environments helps keep that information close at hand. Multi factor authentication is still crucial. Multi factor authentication is like double bolting your front door. A simple lock will keep most intruders out, but it’s also easier to crack, and too many people forget to lock their doors to begin with. Similarly, too many employees use weak passwords, share passwords across systems, or leave password defaults in place. While a secure password security protocol requires strong, unique passwords as well as at least one more security protocol, too many users do not follow these guidelines. As with almost any security measure, multi factor authentication provides an additional security layer that can safeguard against some common security lapses. When users log on, they are asked to enter a code sent to an email address, or respond to a prompt on their phone asking if their log on attempt is valid. By requiring an extra factor of authentication, these systems help ensure the person logging on to the account is who they say they are. Data encryption is another security measure businesses should employ as broadly as possible to protect their data. For cloud environments, data should be encrypted both in transit (while it is being uploaded or downloaded from the cloud), and at rest (when it is stored on the cloud, but not in use). This encryption means that, even if a security breach were to result in that data being stolen, the data thief would be unable to decode what any of it means, thereby rendering it valueless. Deploy web application firewalls where necessary. Another security measure common for hybrid cloud environments involves a web application firewall. While normal firewalls protect server side traffic, a web application firewall monitors HTTP traffic as it goes to and from an application. This can prevent several common attacks that are the result of flaws in a web application from spreading to the rest of your system. Data security for hybrid cloud follows many of the same best practices as data security elsewhere. In broad strokes, much of the security measures businesses should follow for hybrid cloud environments are similar to ones they should follow in other security contexts. Identification and classification of controlled documents, limited access to sensitive data, and the proper use of passwords, encryption, and firewalls are all standard. However, the exact deployment of these strategies will depend on how your cloud environments are configured. It’s important to work with specialists who can understand these environments, lest you end up in a situation where a cloud storage server is unwittingly exposed to public browsing (as happens all too frequently when users don’t realize the implications of their access settings). If you need help configuring your cloud environment or have an interest in moving to a private cloud environment, we can offer a complimentary network assessment for new businesses. Contact us today to get started. « How Frequently Should You Backup Your Hard Drive?